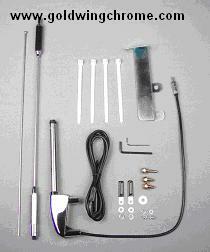 This antenna will work on any GL1500s. This antenna comes complete with all mounting hardware. Sold Separatelly : 18673-629AA - Replacement tip only. 15673-629A - Chrome Base Accent. 15673-629B - Chrome Tube Top Accent.